After their success with the release of hybrid shoes in the year 2008, the Jordan Brand are looking to have a repeat of it as they kicked off the year by releasing a new colourway of the Air Jordan 6-17-23 that is set to hit the shelves this coming Saturday, 8 January. 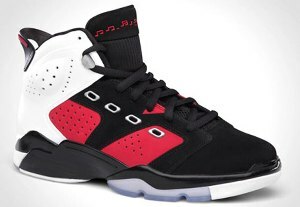 Featuring the heel and lace eyelets of Air Jordan 17 and combined with the construction and icy outsoles of the Air Jordan 6, the 2011 edition of the Air Jordan 6-17-23 will come out in Black/Carmine-White colourway and it is yet to be known if it will be a hit in the market after drawing flacks when it was unveiled last year. Despite the criticisms, the new Air Jordan 6-17-23 is worth trying because it will come out at a very reasonable price, considering its unique design combination and durability.